Military thrillers like this meet a need for men's fiction. Don Brown served five years in the US Navy as an officer in the JAG Corps. He left active duty in 1992 to pursue private practice, but remained on inactive status through 1999, rising to the rank of Lieutenant Commander. The author is also a rising star in the geo-thriller category. When British geologists secretly discover the world's largest oil reserves under the desolate, icy tundra of Antarctica, Britain and Chile form a top-secret alliance against Venezuela, Argentina, and Russia for control of resources that will rival the economic power of OPEC. But the secret of the discovery is soon uncovered by an Argentinean intelligence officer using highly sophisticated monitoring equipment. When a Venezuelan surprise-attack against the secret British research station in Antarctica triggers a shooting war between the great nations, Chile and Britain ask America for help. For two couples separated by the raging battle, the outcome will be either love reunited or devastating heartbreak. There is no in-between and no turning back. For a young boy living with his mother in London, the life of the boy's father and mother's long-lost love is on the line. And for an American sub commander detailed on a special military assignment to his father's homeland of Chile, any hope of a future is in danger. But will his fate be a crushing death under the icy-cold waters of the Antarctic Ocean, or a fate of life, light, and a second chance for love? 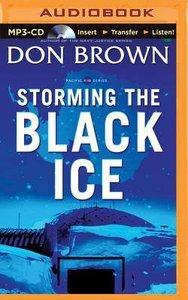 About "Storming the Black Ice (Unabridged, MP3) (#03 in Pacific Rim Audio Series)"
Don Brown (JD), a former Navy JAG Officer and the author of Zondervan's riveting Navy Justice Series - Black Sea Affair; Defiance; Hostage and Treason Most recently he has produced THe Malacca Conspiracy and Thunder in the Morning Calm. He is founder of Brown and Associates, PLLC. Don went on to receive a Juris Doctor degree from Campbell University School of Law. He spent five years in the U.S. Navy as an officer in the Judge Advocate General's (JAG) Corps. During that time, he served with the U.S. Attorney, served in the Pentagon, and was published in the Naval Law Review. He continued his studies at the United States Naval War College in Newport, Rhode Island earning the Navy's nonresident certificate in International Law.